Description: Power for train 571(SQPG) waits to go north at Squamish. Description: In the yard at Stevens Point. 0911 hours. Description: BCOL #4619 with train at CN Nichoals Yard. Description: The CN coal train at WABIC swapped out its power after coming up to the yard and is ready to depart Decatur to head to Mt. Pulaski. 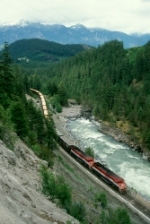 Description: A BC Rail unit trails on a CN coal train. Description: BC Rail in the yard on a cloudy July day. Description: There are now several of these BC Rail units floating around Illinois on the CN system. Description: This unit shows up at the local CN yard for the second time in a week. Description: CN Train 490 is approaching Caniff Street on the Holly Subdivision just after meeting Train 451. Description: CN Train 490 is pulling over State Fair Avenue In Detroit as they make an intermodal setout at Moterm. Description: This is so rare to see a Bcol leader in Quebec. Description: With a CN SUV and two employees tagging along, the crew of today's westbound CN/WC train head up to the MNNR yard. Glad I got the WC hopper on the right into the shot. BTW: if the crew of the SUV sees this, I'd be happy to send them a copy if you like. Description: The CN/WC hogger applies the motive power to bring a cut of cars out of the Minnesota Commercial yard to be switched onto todays westbound to Wisconsin. Note the CN vehicle on the right.